A project to restore and enhance the historic church of St Grwst’s in Llanrwst has been awarded a £12,000 grant by Conwy County Borough Council. The plan for the fifteenth century Gwydir Chapel, which is built onto the side of the ancient church and houses the coffin of Llywelyn the Great, will see a community and tourist hub created on the site. The £12k awarded from the Community Project Match Fund will contribute to the installation of kitchen and toilet facilities. Cllr Dr Mark Baker, the Cabinet Member for Community Development Services and Regulation, who is on the awarding panel said: “I fully support the reordering of St Grwst’s Church with the Restoration of Gwydir Chapel and the creation of a community and heritage hub. It will be a great asset to link the local community and local heritage and attract visitors to the town all year round. The group have worked hard and applied for various grants along with local fundraising and I wish them every success”. The project will provide new disabled access, vital repairs and upgrading work to the buildings, and will help open the church to new audiences. Activities such as musical performances, exhibitions, workshops, and cinema screenings are also in the pipeline. Olwen John, one of the project team and a server at St Grwst’s, said: “We are delighted that this project has been awarded Community Project Match Funding from Conwy County Borough Council. This grant is a fantastic boost to our funding and will help us deliver this ambitious programme of conservation and redevelopment for St Grwst’s. Built originally in 1170, St Grwst’s is reported to be the only church dedicated to the saint. After being partially destroyed during Owain Glyndwr’s uprising in the 1400s it was fully demolished during the War of the Roses in 1468. The building that stands today was constructed in 1470, with further alterations and additions made over the following centuries. 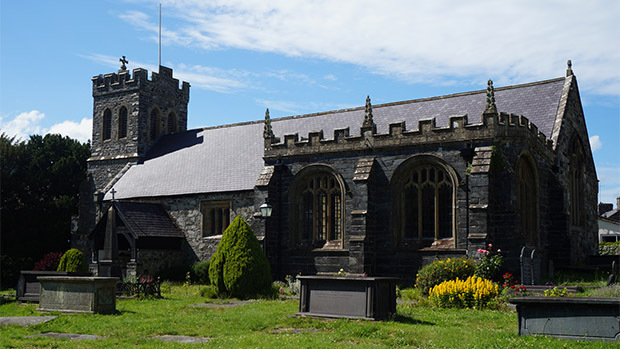 St Grwst is one of 216 churches in the Diocese of St Asaph, one of the six dioceses in the Church in Wales, an independent Province of the Anglican Communion. St Grwst is part of the Aberconwy Mission Area which links churches along the Conwy Valley and Llandudno Junction.